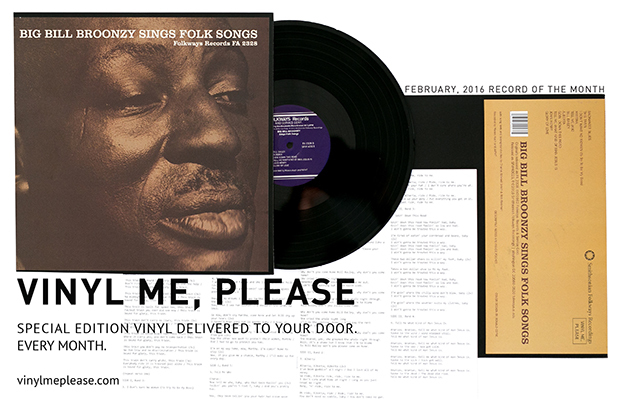 This month we partnered with Smithsonian Folkways Recordings to reissue the 1962 Big Bill Broonzy classic, ‘Big Bill Broonzy Sings Folk Songs’. This album shows Broonzy lending his unmatched blues vocals and propulsive guitar to classic folk songs. The album has been remastered exclusively for Vinyl Me, Please by the GRAMMY-award winning Pete Reiniger of Smithsonian Folkways. The story of why we picked this record started almost a year ago. We found out the legendary Smithsonian Folkways label was considering a push back into vinyl and as soon as we heard about it we knew we wanted to work with them in one way or another. Their timeless pressings are to record collectors what my mom’s holiday Jello casserole was to the younger me which is to say both irresistible and irreplaceable. Looking through their catalog was like opening up a time capsule, but instead of finding a tube of 80’s Crest toothpaste and a Walkman we found some of the best artists and albums you (maybe) have never heard of and which had a fundamental role in shaping American music. Given all the possibilities, the choice was overwhelming. I mean, in many ways there were no wrong choices, but we wanted to make sure we found something that was particularly influential and important. After quite a bit of searching and a few debates in the office, we settled on Big Bill Broonzy as the artist we knew we wanted to feature. He was just too damn good and too damn important not to… and that album cover. He was (and is) one of the most important Blues guitarists and singers ever. And we mean ever, like, ever ever. And Big Bill Broonzy Sings Folk Songs is certainly one of his best albums, hands down. It’s also one of the best introductions to the breadth of his talent. We hope you enjoy this record, and that you take the time to sit and listen closely to one of America’s greatest musical talents of all time. They quite literally don’t get much better than this.